1 of 4 Cut muffins into 1/2-inch cubes, or crumble with fingers. Spread onto rimmed baking sheet with the chopped pecans. 2 of 4 Roast in 400 degree F oven for 8 minutes or until fragrant. Remove from oven and let cool. Leave oven on 400 degrees F.
3 of 4 Meanwhile, melt the butter in a medium-size skillet over medium-high heat. Add onion, celery if using, and carrot; cook, stirring frequently, for 7 minutes or until vegetables are softened. Add the red grapes; cook for 2 minutes. Season with 1/4 teaspoon of the salt, stirring to combine. Remove the skillet from the heat. 4 of 4 Place muffin-pecan mixture in large bowl. Add vegetables, remaining 1/2 teaspoon salt, the black pepper, cayenne, sage and egg; stir to evenly moisten the dry ingredients. 1 of 2 Mix together the sage, salt, pepper and melted butter in a small bowl. Rinse chicken and pat dry. Rub butter mixture over the outside of the chicken and under the skin of the chicken breasts and thighs. Fill the cavity of the bird with the dressing, mounding slightly. Place any additional dressing into neck cavity. Tie the legs of the bird together with kitchen twine. Place chicken on a rack in a roasting pan. 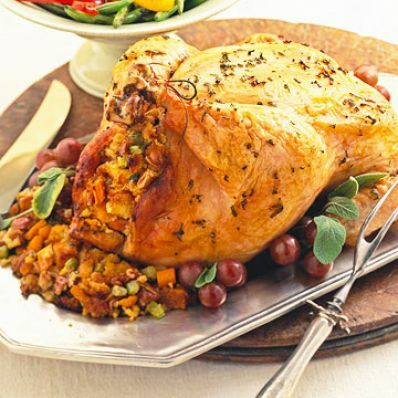 2 of 2 Roast in 400 degree F oven for 75 to 80 minutes or until instant-read thermometer inserted in the thickest part of the thigh without touching bone registers 180 degrees F. Remove the chicken to a platter and let rest for 10 minutes. Remove the dressing from the chicken and spoon into a serving bowl. Carve chicken into serving pieces. Keep warm. 1 of 1 Place the roasting pan on a stovetop burner set at medium-high heat. Add wine, using a whisk to scrape up any bits stuck to the bottom of the roasting pan. Sprinkle the flour into the pan; whisk until the mixture is smooth. Gradually add the chicken broth, whisking constantly. Simmer for 3 minutes. Taste and adjust the seasoning with salt and pepper if needed. Serve the gravy in a bowl or sauceboat with the chicken and dressing. Makes 8 servings.